Oh heaven. This recipe was highly recommended by my friend Jen, so I just had to try! She was right – these are to-die-for! 1. Preheat oven to 350F and grease a 9×13″ pan. 2. In a medium-sized microwave-safe bowl, or in a saucepan set over low heat, melt the butter, then add the sugar and stir to combine. Return the mixture to the heat (or microwave) briefly, just until it’s hot but not bubbling; it’ll become shiny looking as you stir it. Heating this mixture a second time will dissolve more of the sugar, which will yield a shiny top crust on your brownies. 3. While the sugar heats a second time, crack the 4 eggs into a bowl, and beat them with the cocoa, salt, baking powder, espresso powder, and vanilla until smooth. 6. Spoon the batter into the greased pan and bake for about 30 minutes, or until a tester comes out clean. 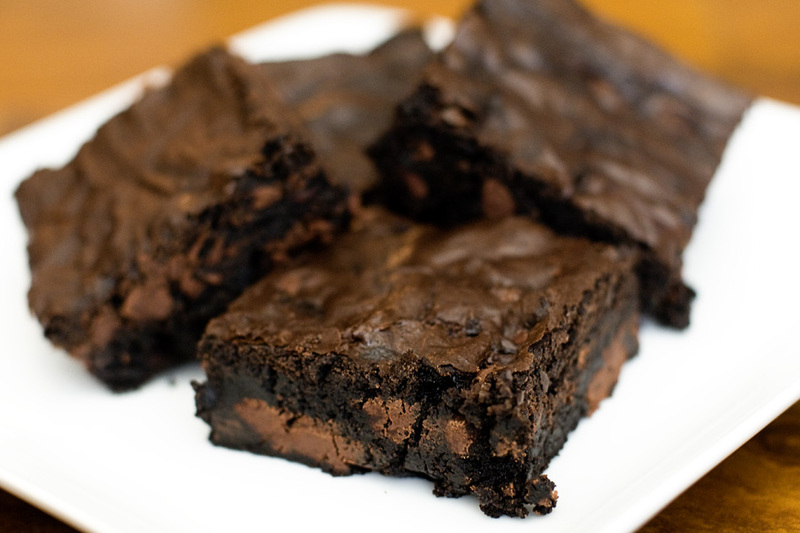 The brownies should feel set on the edges, and the center should look very moist, but not uncooked. Remove them from the oven and cool on a rack before serving. hi again, i used half of the recipe and they were absolutely delicious, thankyou for the recipe.